Around 80 trucks travelled to Gundagai for the 2018 Sylvia’s Gap Truck Run on June 10. Retired interstate truck driver Viv Ireland reminisced about his early trucking years during the Sylvia’s Gap Truck Run on June 10. 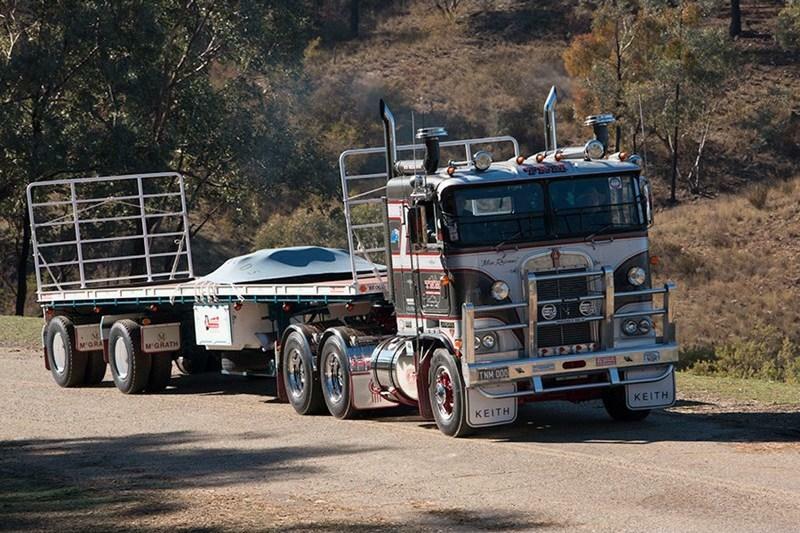 This year the Australian Road Transport Heritage Centre (ARTHC) chose ‘Express Freight of Yesteryear’ as the theme of their annual fundraising weekend at Gundagai, New South Wales. They encouraged former express drivers like Viv to attend. Eighty-year-old Viv was a passenger in Dave Homburg’s 1974 Kenworth K125 during the run from Gundagai to Sylvia’s Gap Road, near Tumblong. "It was very interesting to realise the narrowness of the road," says Viv who lives on the Central Coast, NSW. He spent most of his 50-year interstate career north of Sydney, but remembers occasionally travelling the Sylvia’s Gap section of the old Hume before it was bypassed. Two Grey Ghost Kenworth K125s were among about 80 trucks taking part in the run. A third Grey Ghost was on display at the Gundagai Showgrounds. "I think there was an aura about driving Grey Ghosts," says Viv, remembering his time driving the famous trucks for Comet. "They were a very fast truck and quite exciting to drive." Viv and his friends Colin Southwell, 74, and Ted Scarfe, 78, were guest speakers at the ARTHC’s Saturday night dinner which attracted almost 200 people. After the run the rigs lined up on display at the Gundagai Showgrounds while a morning tea and trophy presentation took place at the nearby racecourse. Rob Woolley of Mangrove Mountain, NSW, won Truck of the Show with his restored 1981 Kenworth K123. Steve Patten of Leeton won Best Historic Truck with his 1990 International TranStar 4670. Funds raised over the weekend will help build a permanent truck museum at Gundagai to replace the temporary museum which opened in 2016. Visit www.arthc.com.au for information about the museum.